Sova, a luxury homegrown personal-care brand, flew leading editors and bloggers down to Jaipur for the weekend for the launch of their brand at Anantaya Jaipur. They housed us the ultra-luxurious JW Marriott Resort & Spa whose architecture draws inspiration from local Rajasthani royal decor - elegant blue, white and metallic color schemes, beautiful archways and delicate hand-painted patterns. After a proper lie-in, I was ushered down to lunch at Mohan Mahal, the restaurant inspired by Amer Fort's Sheesh Mahal. As you can see, it's absolutely breathtaking. The restaurant is lit up with just candles that reflect the mirror decor lending an atmosphere of true royalty. Lunch included an authentic Rajasthani Thali fare concocted with fresh local ingredients. Delicious! Later in the day, we met with Sova founders Vasu Gandhi, an entrepreneur and graduate from FIT, NY, and Sneha Daftary, a hair-care expert with nearly 15 years of experience, who owns and runs Vous, a reputed luxury hair salon in Mumbai. They took us through all the products the brand has to offer - shampoos, conditioners, oils, masks, serums, soaps and more, over high tea and drinks. 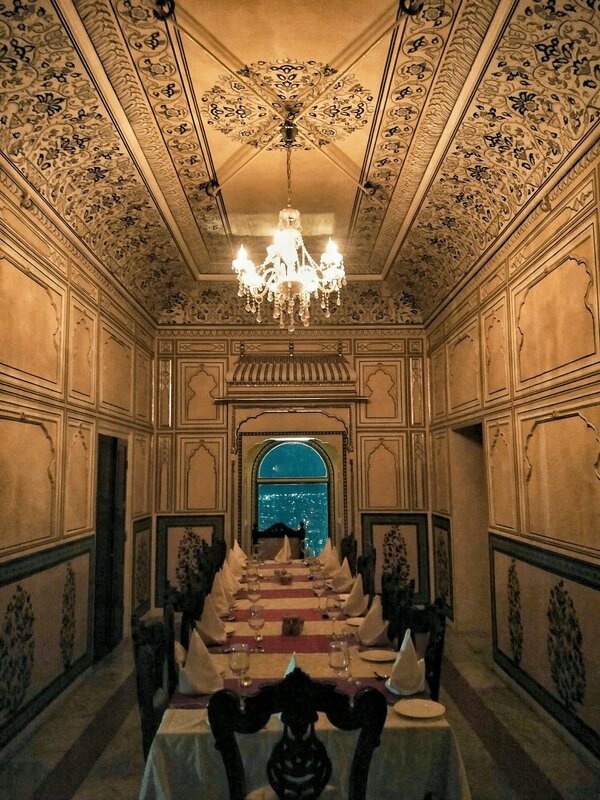 We were then whisked off to the top of Nahargarh Fort, upon which sits the heritage restaurant Once Upon a Time - one of the best spots to enjoy the sunset in Jaipur, along with scrumptious Marwar food and live Rajasthani folk music. The most perfect way to end a lovely weekend!